The statement came hours after several news outlets, citing internal U.S. intelligence assessments, reported that Kim Jong-un‘s regime has successfully made a nuclear warhead small enough to fit inside its missiles, an advancement that was reached sooner than military experts had predicted—and one that added to concerns that North Korea could be capable of building a nuclear-armed intercontinental ballistic missile (ICBM) that could potentially reach the United States. 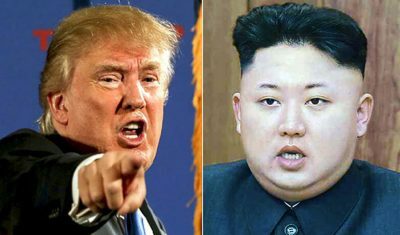 Trump’s threat added to the concerns of many who have strongly urged diplomacy to de-escalate tensions between the U.S., North and South Korea, and others in the region. Siegfried Hecker, the last known American official to inspect North Korea’s nuclear facilities, said prior to Trump’s statement that treating Kim Jong-un as though he is on the verge of attacking the U.S. is both inaccurate and dangerous. Former White House communications director Dan Pfeiffer also wondered if Trump was speaking spontaneously about the threat of nuclear war, rather than relaying a new policy that had been reached after deliberations with his military advisors—an action that wouldn’t be unprecedented by the president.